Did you see the recent blog post featuring our lovely baking gift wrap available over in our shop on www.notonthehighstreet.com? Well, we thought we'd do another round up featuring our gorgeous enchanted design, whilst sharing the love for all things golden for the girls in your world who love it sparkly. Well, in our studio, that just about covers everyone! 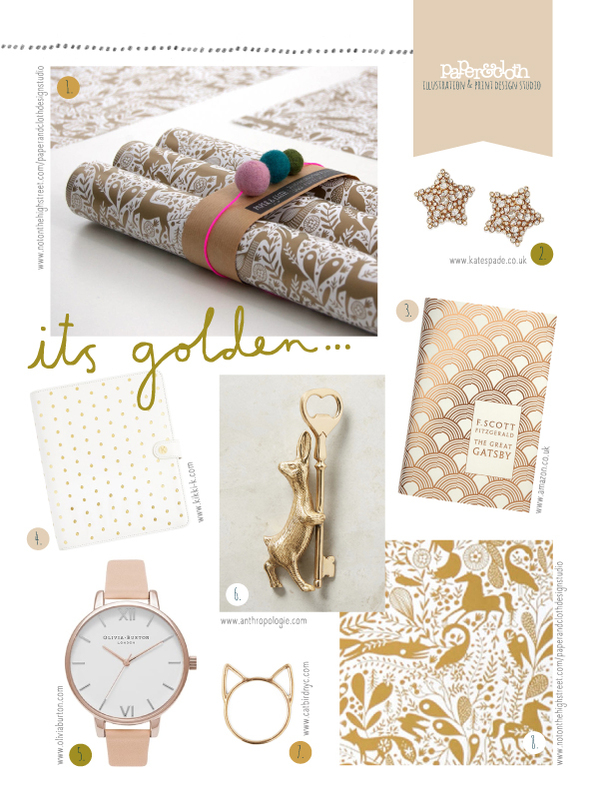 Who wouldn't want a fancy gold rabbit bottle opener or that super cute cat ring, and then beautifully wrapped in our Gold metallic enchanted wrap. 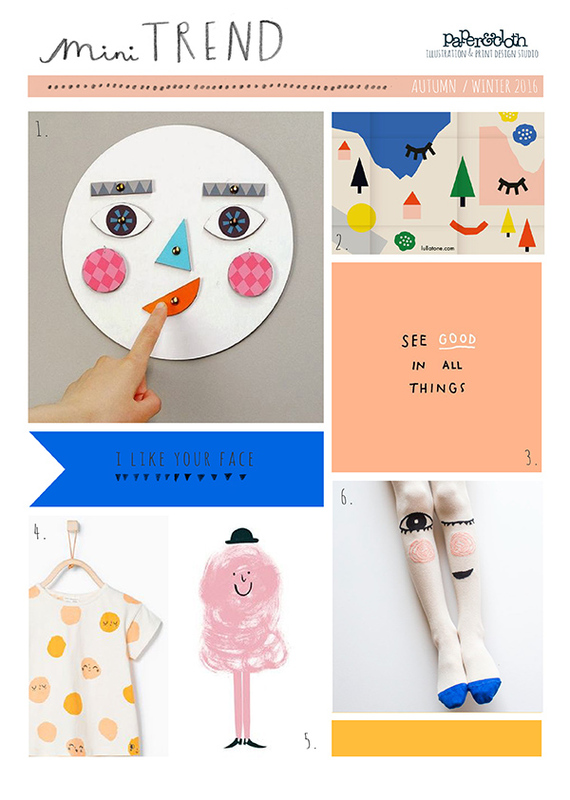 Happy faces have been spotted everywhere, hidden in geo prints and popping up in polka dots! With only 5 more weeks until Christmas, we're getting into the festive spirit with these colourful kidswear pieces from Mini Boden. 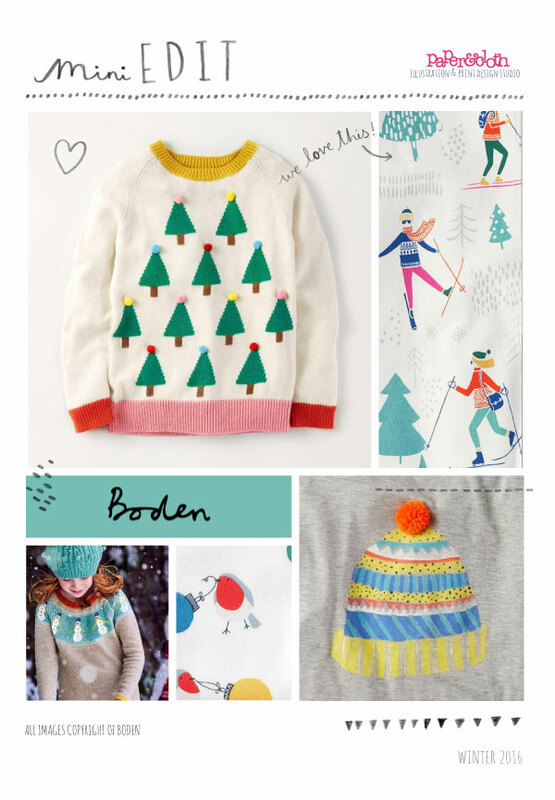 Mixed brights and hand-drawn patterns keep things fun, especially in that mini skiers print! 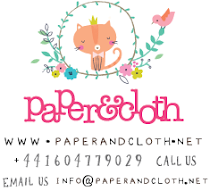 Welcome to the Paper & Cloth blog. We are a UK print, design and illustration studio, producing charming, quirky and original art. We love to draw, armed with boundless imagination and fantastic illustrators we love creating new characters, prints and exploring new trends. We have a team of talented designers representing a unique range of skills and techniques, designing for everything from kidswear, stationery, interiors, and textiles through to branding and packaging. On our blog, we'll share little snippets of the Paper & Cloth world; the goings on in the studio, exciting projects and examples of our work. Studio Life: Getting to know... Bec! Off to New York for Printsource! Copyright Paper and Cloth Ltd. 2008. Simple theme. Powered by Blogger.